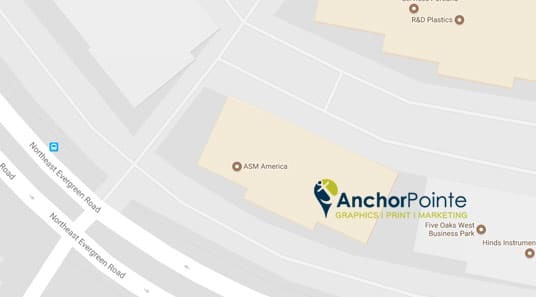 We want you to think of AnchorPointe Graphics as your partner in communicating. Whether it be graphics, print, mailing services, promotional products, or signs and graphics, we work with you to meet each individual need and budget. Your goals are our goals, and we keep you included and informed every step of the way. You are paired with a Project Manager who remains your consistent contact, so they get to know you, your business or organization, and your unique preferences and priorities. We listen and ask questions, so we can accurately guide our designers and production experts towards your ideal end result. We provide digital proofs with every project, and we provide physical proofs to ensure that those tricky projects turn out just as you had envisioned. From design to production, our entire team performs quality checks, communicating any potential issue at every stage, to ensure each finished job meets our client’s expectations. Of course, we are still human, and are not perfect. When we do make a rare mistake, we accept accountability and do what is needed to make it right. We value our business relationships, and will continually strive to improve our performance and earn your trust.